I am currently a post-doctoral fellow finishing several projects in the Pelling lab related to nuclear mechanics and membrane-cortex dynamics in response to controlled forces. Atomic force and confocal microscopy techniques have been the mainstay of my research over the last several years. I am looking to branch out and do some nanolithography and device design. In our previous work, published in Cytoskeleton, we characterized deformations of the membrane/cortex to large local loads from an AFM tip. We observed that 80% of cells recovered their original shape within minutes following unloading. 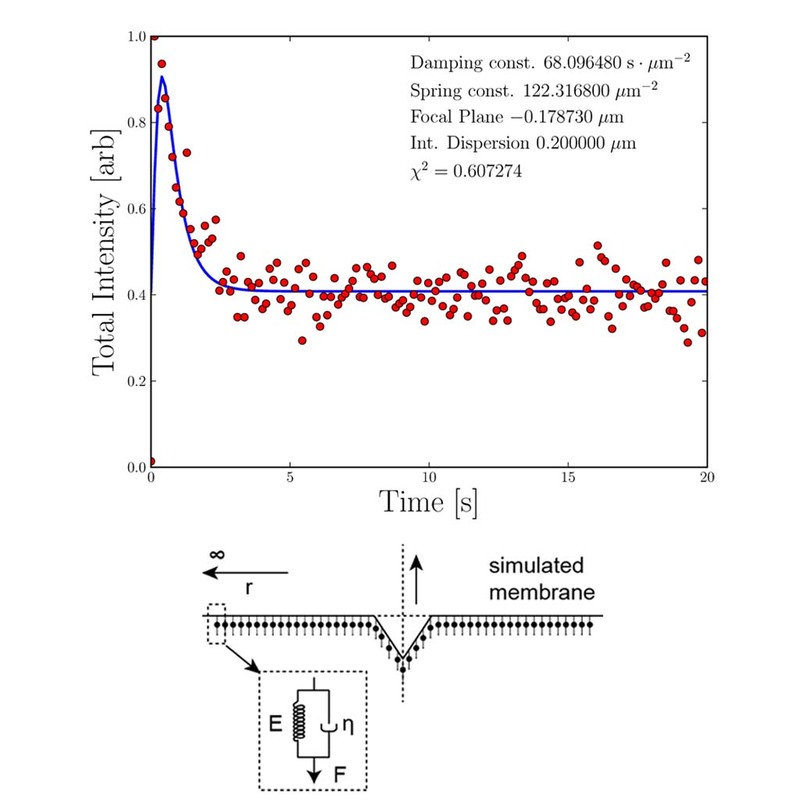 In order to investigate the dynamics of cell shape recovery, we have been working with Dr. Tyler Shendruk (U Oxford) to model the response. Shown in the image is the model demonstrating a fast recovery response. The response was measured as fluorescence intensity over time as the membrane passes through the imaging plane. Examination of directed nuclear deformations in a number of mammalian cells led to the widespread observation of a distinct nuclear anisotropy. These nuclei deform preferentially along their short axis. Why this occurs remains an unanswered question we are actively investigating. 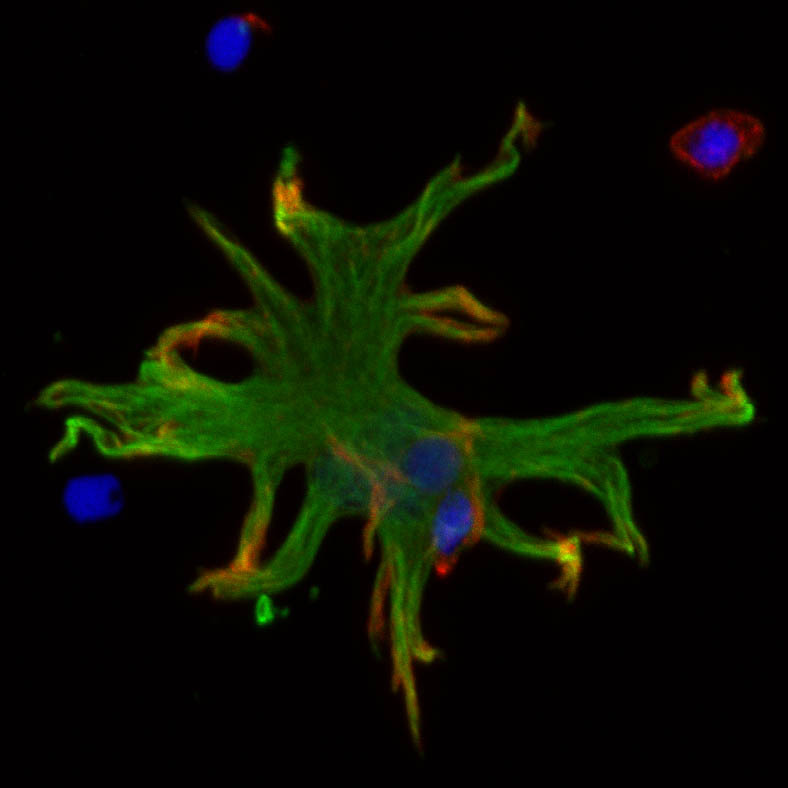 Shown here is an image of NIH 3T3s fixed and stained after treatment with an inhibitor of histone deacytelase (trichostatin A). Chromatin organization as well as lamin expression appears to play a role directing the sensitivity towards a nuclear mechanical anisotropy. I will be presenting this work at the upcoming Biophysical Society Meeting. In collaboration with Ben Campbell and Dr. Micheal Jonz (U Ottawa), we are looking at whether or not seasonal effects play a role in horizontal neuron mechanics. It was noted that patch-clamp sensitivity of these cells varied greatly between summer and winter months. Since then, we have been investigating whether the membrane also becomes more fluid due to seasonal effects. Using AFM, we performed stiffness measurements on the neurons, which seem softer during the summer months. 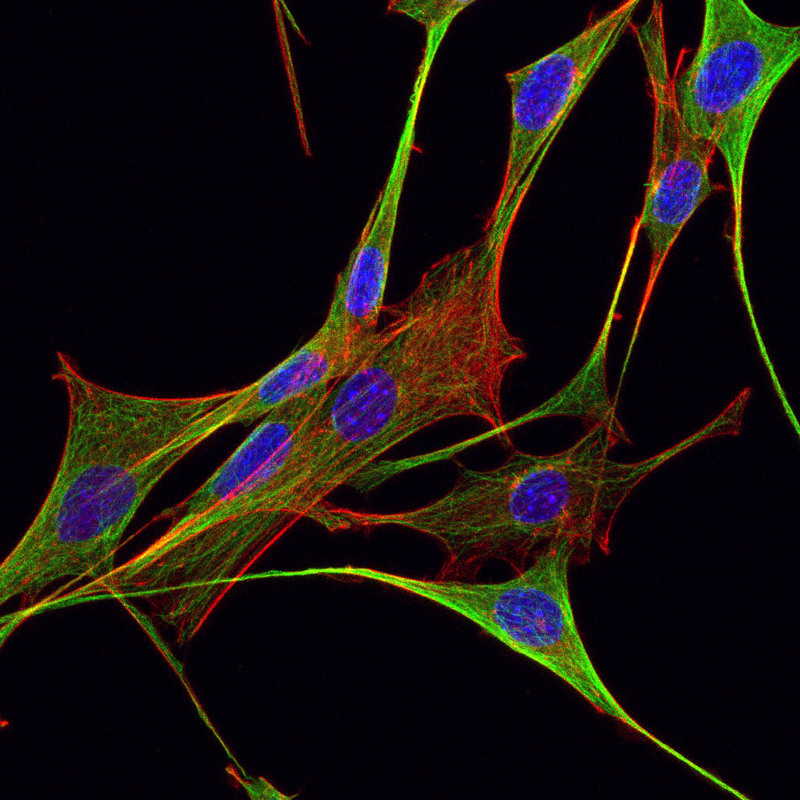 We are now investigating whether or not this change is linked to cytoskeletal structure. (c) 2014 Tinahaase.com. All rights reserved. Modified design by nodethirtythree + FCT.